Malcolm Shepherd has been awarded the Resort and Second-Home Property Specialist (RSPS) Certification. The RSPS Certification is a nationally-recognized certification awarded by the National Association of REALTORS to real estate professionals who wish to demonstrate and promote – to consumers and their peers alike – their expertise in the resort and second home specialty. 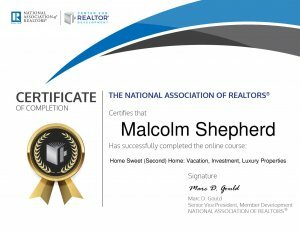 Malcolm joins a select few real estate professionals who have earned the Resort and Second-Home Property Specialist Certification (RSPS).REALTORS who receive the RSPS certification have successfully shown the ability to market and educate their clients on resort, second home investments. He now joins real estate professionals who specialize in buying, selling, or managing second homes in a resort, recreational, and/or vacation destination and properties for investment, development, or retirement. The RSPS certification program offers one of the most powerful networking opportunities. With this certification, Malcolm Shepherd connects with several agent across the nation. If you have any question on resort or second home investments call me today at 775-525-0980 or fill out a quick contact form.